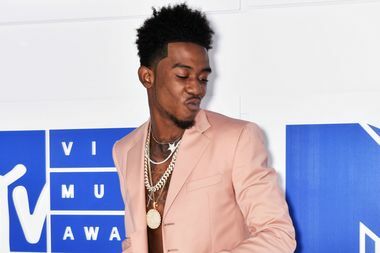 Desiigner at the 2016 MTV Video Music Awards on August 28, 2016. The rapper, known for his song "Panda," was charged with menacing and drug possession, reports said. NEW YORK CITY — Sidney Selby, better known as the Kanye West-affiliated rapper Desiigner, was released without bail on three misdemeanor counts of drug possession and menacing Saturday, according to the Manhattan District Attorney's office. Selby, 19, who is signed to Kanye West' G.O.O.D. Music label, was arraigned in Manhattan Criminal Court after an alleged road rage incident. He was initially expected to be hit with a felony gun charge, but police did not find a weapon in the vehicle, according to the DA's office. The rapper behind the hit single "Panda" was arrested Thursday night after a dispute in which police said he rolled down the rear window of his white Escalade and flicked a lit cigarette at another driver near West 42nd Street and Eighth Avenue about 9:10 p.m., after exiting the Lincoln Tunnel, police said. Selby then pulled out what the driver said was a black firearm and pointed it, yelling, "f**k you do whatever you want," according to the criminal complaint. Selby's SUV fled the scene, but the other driver called the police, who later arrested the rapper near East 42nd Street and Third Avenue. A gun was not found in the car, according to the DA's office. Others arrested at the scene included Scott Siegel, 42; Michael Davis, 19; Utril Rhaburn, 23; and CJ McCoy, 21. Along with the controlled substance charge, Siegel, the driver, was charged with possession of a forged instrument, after police found two forged FDNY plaques in the car. His bail was set at $5,000, according to the DA's office. The other three were each charged with possession of a controlled substance, and were released on their own recognizance, the DA's office said. Defense lawyers for the Bed-Stuy rapper and his associates told the judge the drugs found in the car were anabolic steroids used by Siegel, a chauffeur and bodyguard hired for the night, according to a report in the Daily News. The lawyers produced prescriptions for the pills, but prosecutors argued there were three gym bags with other drugs, which were unaccounted for, according to the report.